A thought crossed my mind... And please don't take this the wrong way - I mean no disrespect to anyone by it... Big Muscle occasionally seems to become annoyed with folks who don't try very hard to figure things out before asking for help. You have to admit, Aero Glass for Win 8+ isn't exactly an easy / turnkey application. Maybe he figures if someone can download a .7z file then figure out how to use 7-Zip to open it they have a few skills and won't mess things up too badly and might be able to help solve their own problems. Clearly he could as easily make .zip files that would just open up in Explorer. Like I said, it's just a thought. You have to do the same for a lot of programs and apps after reinstalling any OS. Believe me this isn't only effecting you. Is there a way to use this via Windows 10? Do you mind providing a link to it? the first pages download link is down. thanks in advance! No it's not, not at the moment. Alright, I got it to work.. one last noob question how do I enable the glass? when I press "Save" nothing happens is there any file I need in order to make it work or do I need to go through the guide process before doing anything? You need the Aero Glass for Win8.1+ v1.3.1 product installed if you're running WIn 8.1 (or Aero Glass for Win8 v1.3 if you're on Win 8.0). 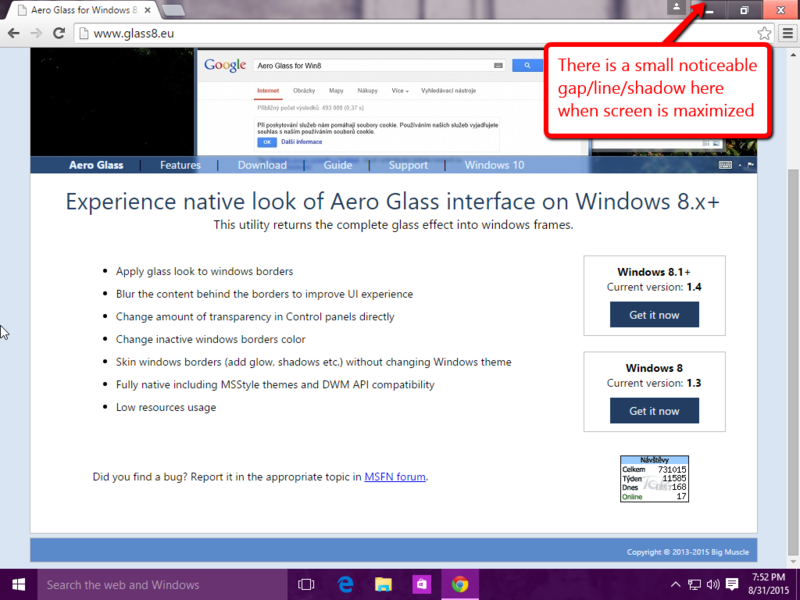 You get it from that same site on which the Aero Glass GUI tool is hosted is where you get the software. The GUI tool is only for configuring it once it's installed. The released version comes with its own installer and is fairly turnkey, and there's a prototype test version that an advanced user can make work on Windows 10. I wouldn't recommend the latter unless you're quite familiar with system tweaking and such things as registry editing and file and folder manipulation. If you've installed the product, some common things to look for: It disables itself, I believe, while running on battery. There's a registry entry that can be reconfigured for that. I would like to report a bug. In the title bar there is a noticeable gap/line/shadow above to minimize and maximize buttons. See photos below. I am running Windows 10 Build 10240 RTM. I do not like the borders around windows. 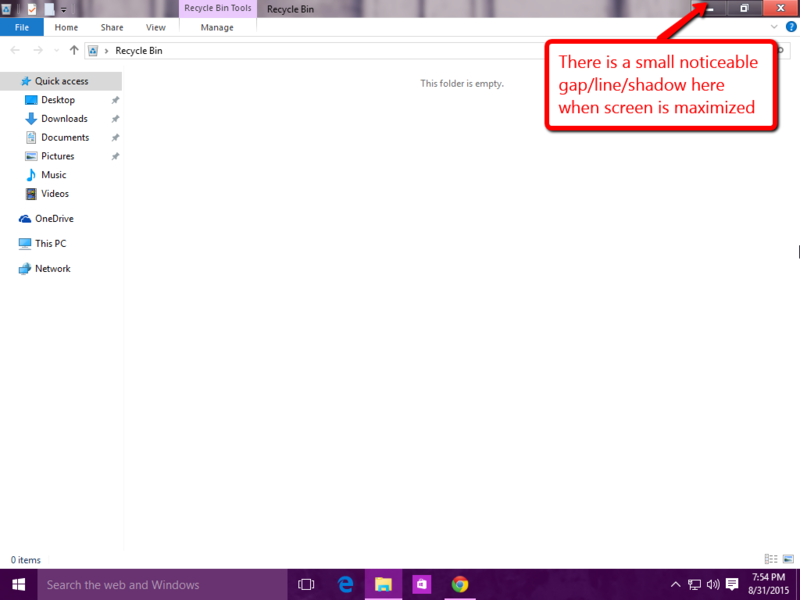 I prefer not to see them at all because they don't have that clean 1px line around the window look that Windows 10 has. The border looks terrible especially in the settings and any other windows that have a gray title bar. See photos below and you will know what I mean. 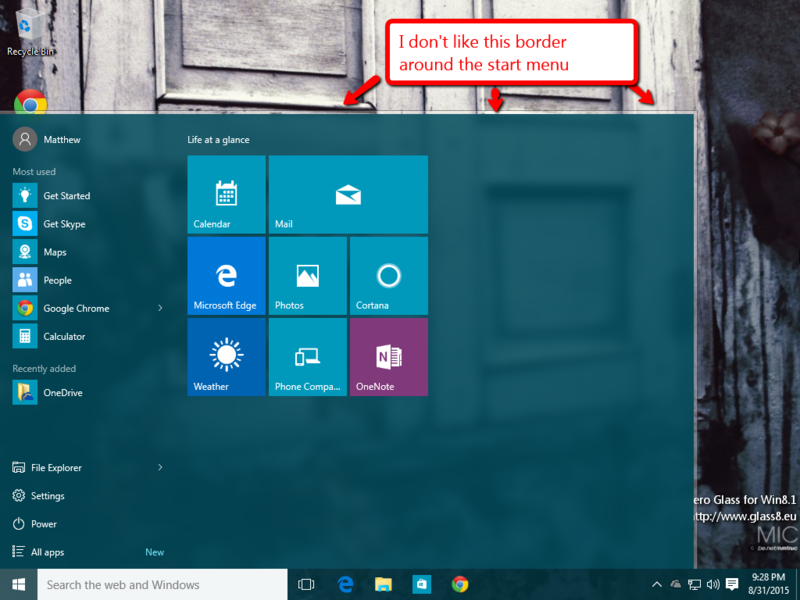 I really do not like the border around the start menu either. The start menu does not need a border. This looks so much better. See photo below. Please remove the borders they are unnecessary. We are using Windows 10 now. 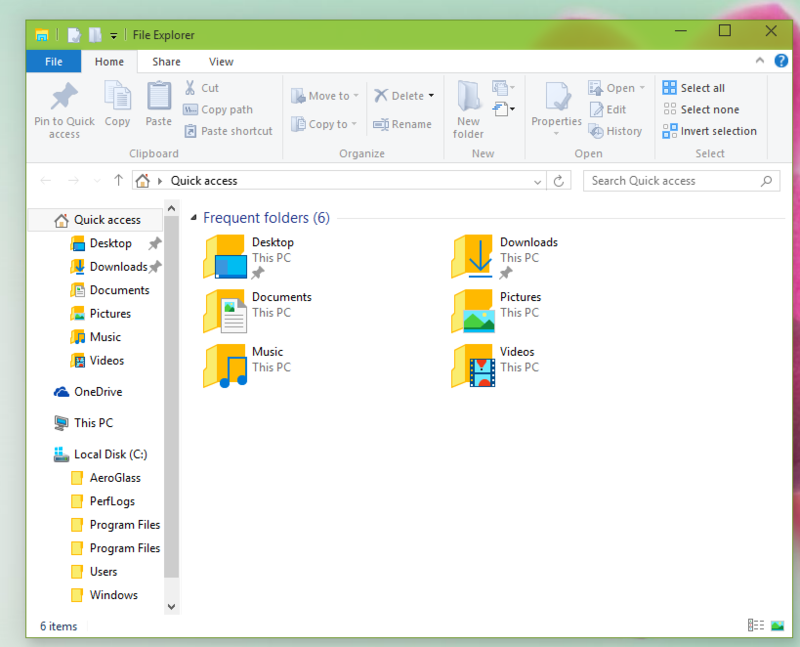 The 1px borders that Windows 10 gives us are much cleaner looking. We are using Windows 10 now. 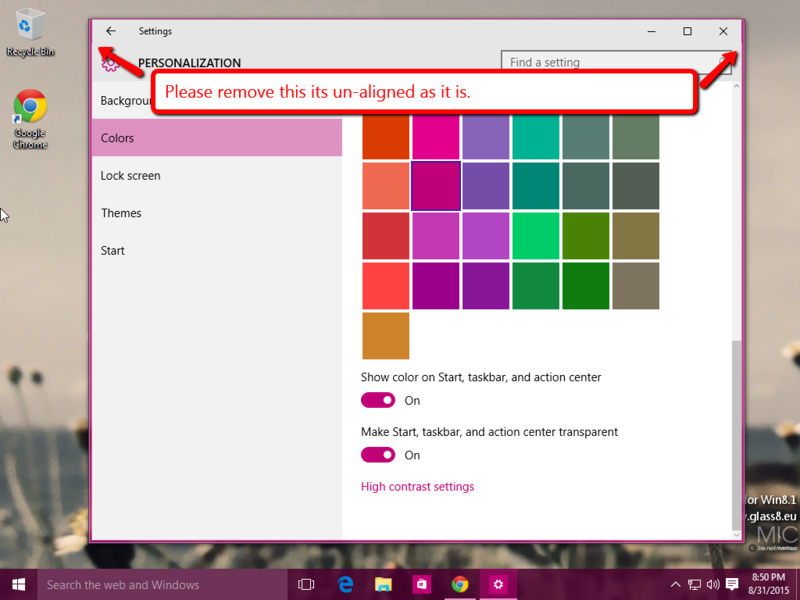 The 1px borders that Windows 10 gives us are much cleaner looking..
LOL, speak for yourself. Windows 10 is much something looking, but I don't think I'd use positive adjectives. You seem to be hoping for perfection in an operating system that's barely able to function. It isn't the Microsoft of 5+ years ago. Watch for full 3rd party theme replacements. One of those might get you closer to an overall integrated look of perfection. But probably not. The fundamental problem is that everything Microsoft is doing is anything but integrated. Download link is not working. Right-click it and Save As a .7z file.